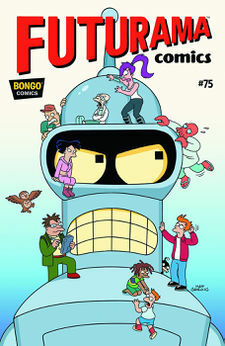 Characters on the cover: Bender, Leela, the professor, Scruffy, Zoidberg, Amy, an owl, Hermes, Fry, Nibbler, Dwight, and Cubert. "Bendership Galactica" is the seventy-fifth comic issue, released on 1 July 2015  in the US. When the Planet Express ship is destroyed while on a mission in space, the crew including Professor Farnsworth, Amy, and Zoidberg must take refuge in a makeshift spaceship... made out of Bender! Trapped in space without a propulsion system and forced to live in close quarters, the crew must survive not only the many computer viruses infecting the robot but something even more deadly... one another! The issue's title is a reference to Battlestar Galactica. The cover image next to the description in the back of "What the What if?" is from "The A-Team", suggesting this issue's cover wasn't finalised yet. Hermes, Nibbler, Scruffy, Cubert, and Dwight all appear on the cover image despite not making any appearances in the comic itself. A Nixon badge from the 3008 Earth presidential election is among the items in Bender's chest. Bender and Fry's apartment is decorated to look like the inside of Bender's right leg. Scruffy's credit card is inside Bender. Scruffy's name is a mononym. Click here to see cultural mentions made in this issue. The nerds on the opening-page internet-discussion debate whether Firefly's Mal Reynolds and Star Wars' Han Solo are the best captain. Fry still believes Star Trek: Voyager's Janeway is underrated. Starbuck and Starbuck from Battlestar Galactica (the latter played by guest star Katee Sackhoff) appear after their ship hits the enlarged Bender. The Voltron lions are the inspiration for the transforming robot dogs. The Iron Giant, from the film of the same name, can be seen lifting weights in the giant robot prison at the end of the comic. Bender says "never get that iron guy talking about Superman! He just won't shut up!" - this is a reference to the Giant being inspired by Superman in the film. Size changing has also been featured in "Anthology of Interest I", "Downsized! ", and "Attack of the 50-ft Amy", but was too expensive to appear in "Parasites Lost". Kif's wallet has his name misspelled "KIFF". Farnsworth: Fry, what's going on? Give me the short version! Fry: Also, we need more signs on the doors! I thought a closet was the bathroom and waited for it to be free for hours last night! Also, no one go into that closet! This page was last edited on 2 September 2015, at 21:47.